The Maxabene 3:2 and 3:3 young males were born to the Maxabene 2:2 female in October 2008. This means that in April they turned 3 ½ years old. Whilst both were quite late in reaching independence, both are now independent of their mother and one would expect that they would be in the process of establishing territories of their own to enable them to carry forward their genes. The Maxabene 3:2 young male lying in the Maxabene Riverbed, glances up at an impala kill he hoisted into a tree. This is in the centre of his father, the Camp Pan male's, territory. This week I witnessed something that I have never seen or heard of before, and this prompted me to think about the differing approaches of the two Maxabene young males. 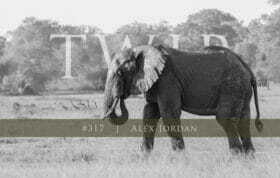 We found the Tamboti female and the Maxabene 3:2 young male together just south of the Londolozi airstrip. This in itself was not all that unusual, as we have seen these two cross paths before, as the Maxabene young male spends a fair amount of time in the Tamboti female’s territory. What was extremely unusual, however, was that the Tamboti female was clearly in oestrus and was trying to get the Maxabene young male to mate with her and he wasn’t at all interested. He was, in fact, acting extremely aggressively towards her and she had a couple of wounds on her back leg to show for her efforts. The Tamboti female poses in the afternoon light, contemplating how to get the Maxabene 3:2 young male to mate with her. 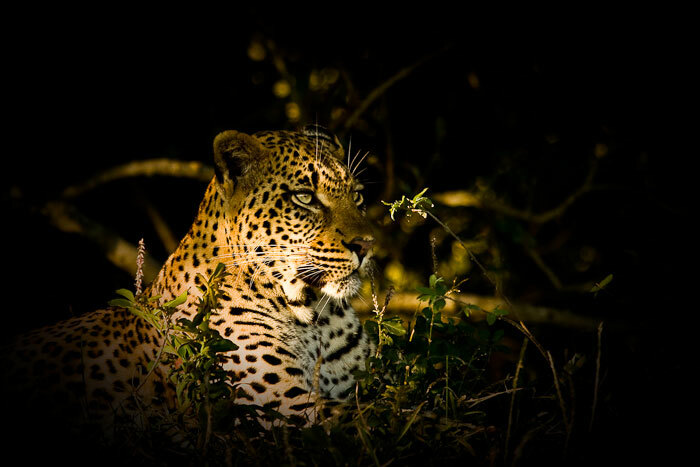 Surely she is one of Londolozi's most beautiful leopards. The Tamboti female lies watching the Maxabene 3:2 young male's every move. She would approach him, performing lordosis, being a series of seductive moves including swaying to and fro before lying in front of him, inviting him to mount her. Each time she approached him, growling softly as is the norm, he would respond with an aggressive snarl. If she continued, he would lash out at her with claws extended. The Tamboti female performing lordosis, swaying in front of the Maxabene 3:2 young male, trying to seduce him into mating with her. His snarl is a clear indicator of how he feels about this proposition. How would you go about interpreting this behaviour? The Maxabene young male has never mated before as far as we know. I think that it is likely that a first mating, and even subsequent matings for that matter, must be quite a confusing time for leopards. 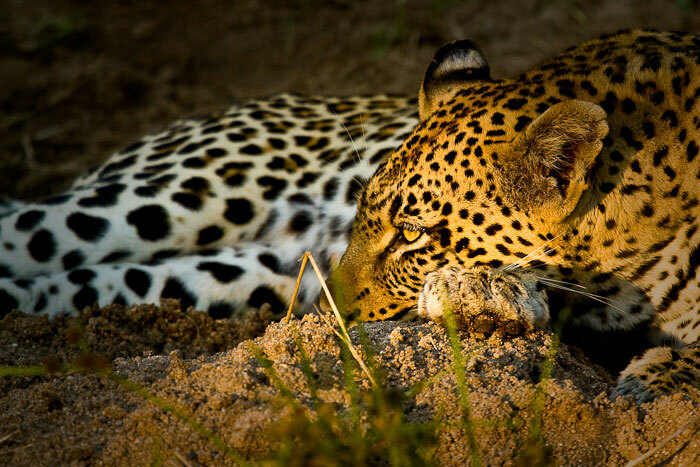 These are solitary animals and are therefore not used to such close interactions with other leopards. I’m sure, however, that mating is instinctive and that whilst it may be slightly confusing to the animal at first, hormones and instinct will take over and the leopard wouldn’t refuse the advances of an oestrus female. A couple of people have suggested that the Maxabene 3:2 young male is too young to mate and doesn’t know what to do, hence the resistance. I don’t believe this to be true at all. As stated above, mating should be purely instinctive and although he is still fairly young, he is sexually mature. I have heard of young male lions, in the absence of dominant males, mounting females that are in oestrus and trying to mate with them. I don’t see why it should be any different for leopards. 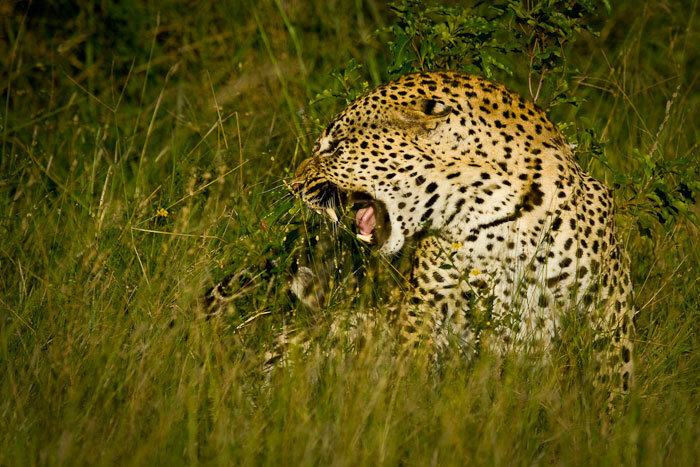 The Maxabene 3:2 young male snarls at the Tamboti female as she gets a bit too close for his liking. The Tamboti female tries to approach the Maxabene 3:2 young male from a different angle, but he keeps his eye on her and shows his discontent. The Maxabene young male, having had enough of the Tamboti female's approaches, lashes out at her, causing her to take serious evasive action. I think that there is only one reason that the Maxabene 3:2 young male is resisting the Tamboti female and that is the fact that he is still in the Camp Pan male’s territory. This whole incident took place in the middle of the Camp Pan male’s territory and, funnily enough, at the time he was feeding on an impala less than a kilometre away. The very next day, the Camp Pan male had tracked the Tamboti female down and was mating with her while the Maxabene 3:2 young male lay just a couple of metres away, seemingly unfazed. 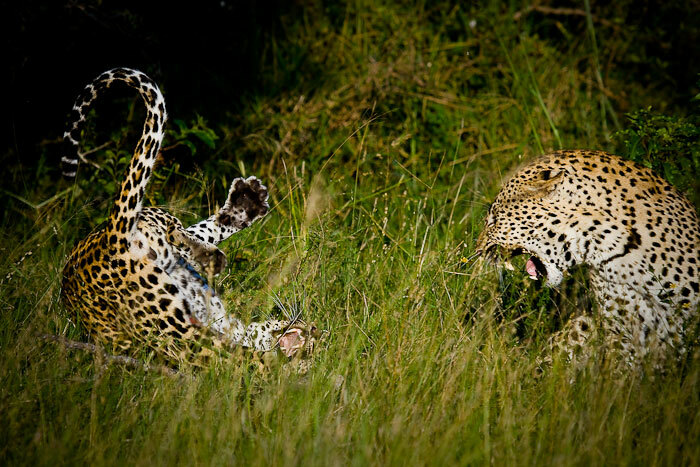 I have never seen the Maxabene young male call or scent mark, both means by which leopards advertise their territory. He is clearly being completely submissive towards the Camp Pan male. If he were to now mate with a female in Camp Pan’s territory, it would be a clear claim of the area as his own, something that he has avoided doing up until now. 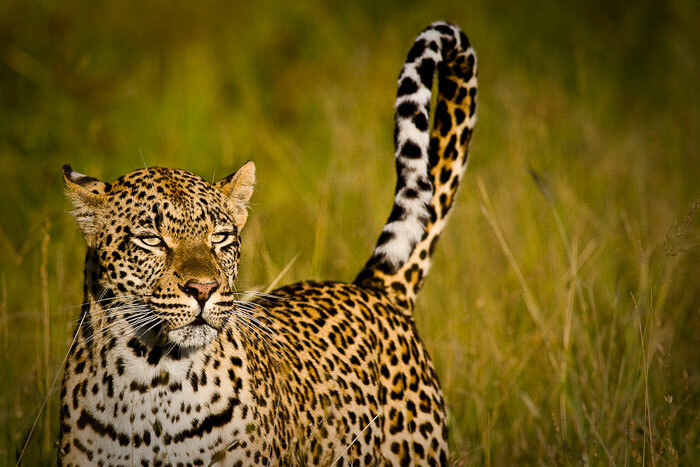 The two main reasons a male leopard establishes and defends a territory are to gain access to females and food. Mating with a female in another male’s territory would therefore surely be the ultimate challenge. One of the most photogenic leopards around, the Tamboti female poses, tail raised. So why is the Camp Pan male still tolerating the presence of the Maxabene 3:2 young male in his territory? I think that it has little to do with their father and son link and rather it is because, at the moment, the Maxabene 3:2 young male poses little competition to the Camp Pan male. He isn’t advertising territory in the area (calling and scent marking) and he isn’t mating with oestrus females in the area. The only area where I think that the Maxabene young male is directly competing with Camp Pan is for food. 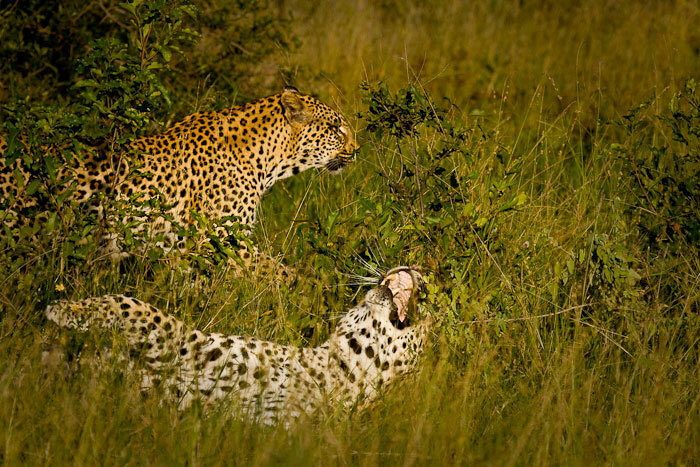 Both leopards are hunting in the same area and access to food is one of the reasons for defending territory. Remember, however, that Camp Pan often scavenges carcasses from other leopards and I have no doubt that the Maxabene young male would again be completely submissive if the Camp Pan male were to challenge him over a kill. 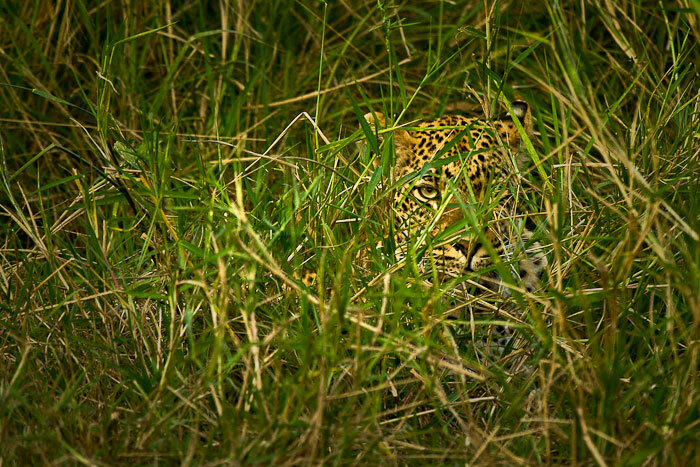 The Tamboti female lying in long grass close to the Maxabene 3:2 young male. 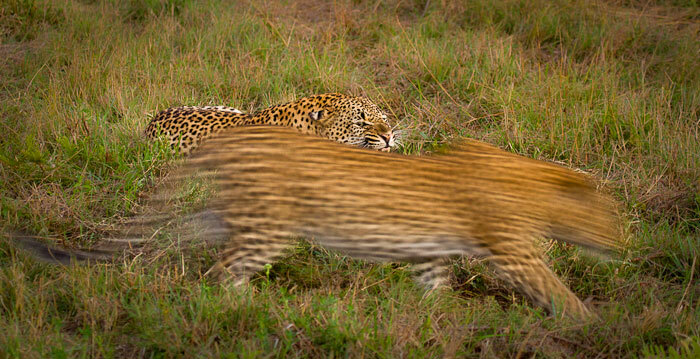 I love how this image shows the effectiveness of the leopard's camouflage. What then is the strategy of the Maxabene 3:2 young male and how does he intend to eventually establish a territory? I think that the Maxabene 3:2 young male knows that the Camp Pan male has the prime territory on Londolozi as he has areas with good cover for hunting as well as high numbers of prey species. He also has access to many females. I’m sure that he also realises that the Camp Pan male is essentially past his prime and it shouldn’t be too long before he starts losing condition. Perhaps he has decided to lie low and try to avoid the Camp Pan male for the time being and sacrifice mating opportunities now for the potential of a highly sought after territory in the future. 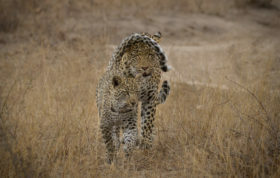 Whilst the Maxabene 3:2 young male is by no means a small leopard at the moment, he will still be filling out and at the same time the Camp Pan male will slowly be losing muscle mass. Over time, things will likely move into the Maxabene young male’s favour and I think he will eventually challenge the Camp Pan male for his territory. The uncertainty, however, lies in how long this will take. The Tamboti female looks into the distance at a herd of wildebeest. The Maxabene 3:2 young male was trying to stalk the wildebeest, but the advances of the Tamboti female broke his cover. Notice how his ears are flattened, one of the first signs aggression. Surely the Camp Pan male can see this coming? Perhaps, but as there is no present challenge, he is unlikely to confront the Maxabene young male. 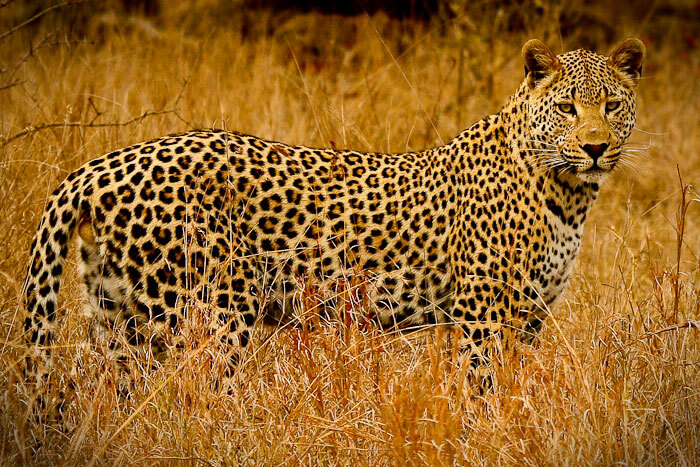 Being solitary animals, leopards will usually avoid conflict at all costs. If they get injured and are unable to hunt, it will likely have fatal consequences. The Camp Pan male is in a catch 22. The Tamboti female walks towards the Maxabene 3:2 young male in the warm afternoon light. I find it fascinating to contrast the strategies of the Maxabene 3:2 and the Maxabene 3:3 young male. The other option for the 3:2 young male would have been to move out of the area and look for an unoccupied territory or one that belongs to a lesser leopard. This is exactly what his brother, the 3:3 young male with the brown nose, seems to have done. 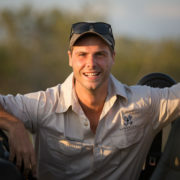 The 3:3 young male is regularly seen in the south western part of Londolozi. This area is just to the west of the Tugwaan male’s territory and seems to be unoccupied. The catch is that it is an area covered with long grass and very few trees. Whilst this provides good cover for hunting, there are not many smaller antelope species in this area, species that are generally favoured by leopard. With fewer trees, there is also increased likelihood of having a kill robbed by hyena or lion. 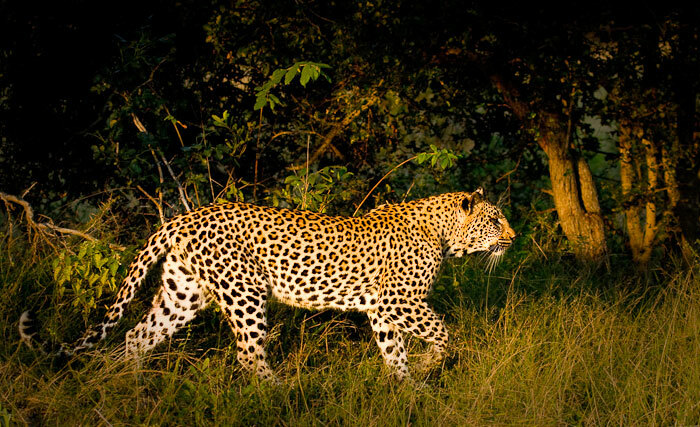 These factors, in turn, mean that there are also few female leopards with territories in the area. So, while the 3:3 young male seems to now have a territory, it seems a much less desirable territory than the one the 3:2 young male is waiting for. The Maxabene 3:3 young male, the brown nosed male who is the brother of the Maxabene 3:2 young male. This picture was taken in the south west of Londolozi. Notice the typical long grass habitat of this area. So which is the most successful strategy? 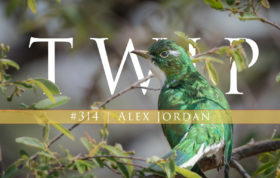 To claim a lesser territory at just over 3 years of age and hold it for longer, with the potential for expanding it later on, or to bide your time, sacrifice mating opportunities and hopefully take over arguably the most prime territory on Londolozi? Only time will tell. What are your views on this behaviour? I am interested to hear everyone’s thoughts on this, I think it will be a great discussion. Very well written James. In my opinion your interpretation is spot on. At least a far as I have seen thus far. I too do not think that a young leopard “does not know how to mate”. These animals are born with some much inherent instinctual behaviour that they surely know how to act! I just wander whether Camp Pan is possibly showing signs of age and the young male knows that if he can hang in a little longer then when the big showdown happens he will be ready…and he will know his piece of turf batter than any other leopard in the area! 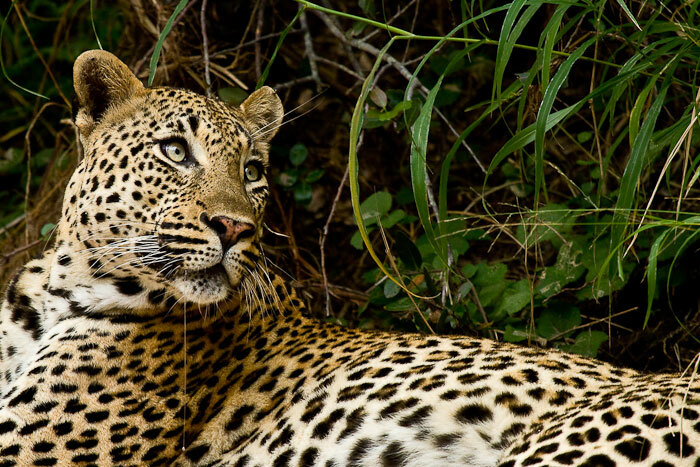 I’m not that familiar with leopards, but it’s a highly fascinating story ! I hope you will give us some updates in time so that we will know about the outcome. Thanks for this report! It’s a pleasure Patrik. I will definitely do a follow up article as soon as there is an update. Hopefully you will keep following our blog to see how the story unfolds. What a beauty!!! Thank You!!! This is very interesting. 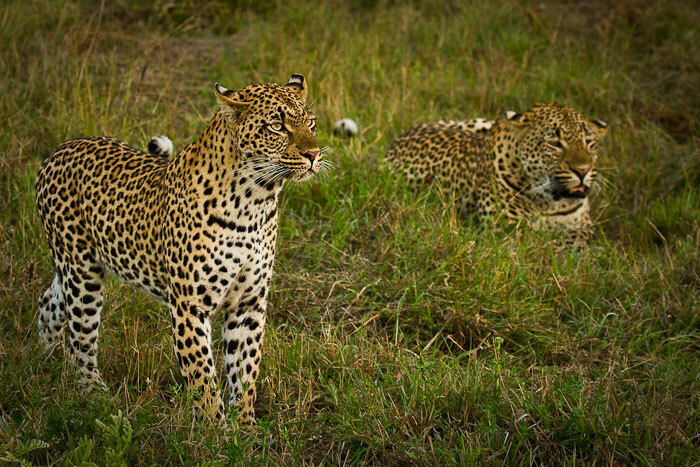 How large are the Maxabene brother leopards compared to the territorial males in Londolozi? Erwin, it would be difficult to say weight wise, but my feeling is that there is not much of a difference now. The Camp Pan male is an enormous leopard, so he is still a fair bit larger than the Maxabene males, although there have been a couple of instances where we have had to look twice in differentiating the 3:2 male from Camp Pan. The Maxabene males are still filling out a bit, but already their tracks are as big, if not larger, than some of the other territorial males. Fascinating reading, waiting with anticipation for the next update , and enjoying the sheer beauty of the pics – Tamboti female gorgeous! Thanks for your comment Judes. The Tamboti female is surely one of the most photogenic leopards around, I absolutely love photographing her. Just an Update, The 3:3 young male has now ventured very far West, and for the past 2 days has been seen on Alicecot, in the Western Sector. Thanks for the update Rudi. It will be interesting to see where he settles. Hi James, awesome shots! Well done! 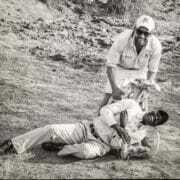 This is what brings me back to Londolozi time after time. Thanks Ted, it was a first for me and such an interesting interaction. This is what makes each day at Londolozi so exciting! I have no idea of course if your theory is correct, but if so, how incredible! It’s mind blowing to think of these gorgeous creatures with such advanced and complex longterm strategic planning capabilities. Wow. Fantastic. Thank you for the photos and for the education! The 3:3 male is now down Southern Sabi Sands after a few fights with the males in the West. He is mating as well. Fascinating to watch these two boys go about establishing their territories as Tu Tones has stayed in the same place and Makhotini is now wandering far and wide looking for new territory. Interesting too that their older brother, the older Maxabeni 3:3 has settled in the east. Please keep us updated. A great story to be told.